Here you may read about The Icelandic Phallological Museum - one of the most original museums in the world dedicated to anatomy and zoology. Learn about its location, open hours and exhibitions. It is probably the only museum in the world that contains a collection of phallic specimens belonging to all the various types of mammal found in a single country. Until recent years phallology has received very little attention in Iceland, except as a borderline field of study in other academic disciplines such as history, art, psychology, literature and other artistic fields like music and ballet. Now it is finally possible for individuals to undertake serious study into the field of phallology in an organized, scientific fashion. The museum contains a collection of over one hundred penises and penile parts belonging to almost all the land and sea mammals that can be found in Iceland. You may encounter thirty specimens belonging to twelve different kinds of whale, one specimen taken from a rogue polar bear, eighteen specimens belonging to seven different kinds of seal and walrus, and fifty one specimens originating from sixteen different kinds of land mammal: all in all, a total of one hundred specimens belonging to thirty six different kinds of mammal. And the museum has also been fortunate enough to receive a legally-certified gift token for a future specimen belonging to Homo Sapiens. 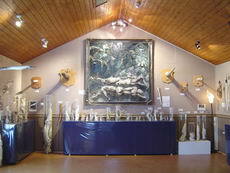 Except the biological section of the museum, visitors can view the collection of about one hundred artistic oddments and other practical utensils related to the museum chosen theme. The Iceland Phallological Museum is “probably the only museum in the world to contain a collection of phallic specimens belonging to all the various types of mammal found in a single country.” There are 151 specimens belonging to 42 different species, including 38 specimens from 15 different kinds of whale in the museum. 12 am to 6 pm daily from 20th of May to 10th of September. By prior arrangement group bookings can be made at other times.